Line Organization is the form of organization, wherein the authority flows from the person present at the top of the organizational hierarchy to the person working at the lowest level. 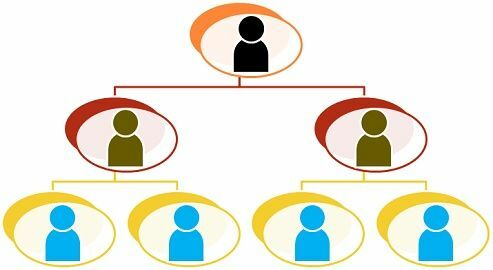 In line and staff organization, the hierarchy remains same as in the line organization, but specialists are attached to the front line managers to advise and guide them on significant issues. A structural relationship is required to be developed between different departments and the people working in them, for effectively accomplishing the objectives of the organization. And so, formal relationship between the members of the organization is set up, so as to coordinate their efforts. Two such formal organizational relationships are line organization and line & staff organization. In the given article we’ve made a comparison of the two types of organization, so read this out. Meaning The organization in which the authority and responsibility moves downward, and accountability flows upward, is called line organization. 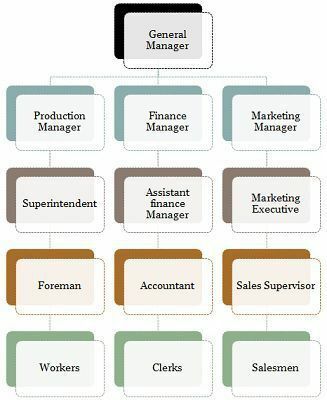 The organization structure, in which specialist are added to the line managers to provide guidance and support, is called line and staff organization. Executives Line executives are generalist. Line executives are generalist and staff executives are specialist. Appropriate for Small organization with less number of employees. Large organization with a number of employees. Line organization, as the name suggests, is an organization wherein a direct vertical relationship between the superior and subordinate exists. It relies on the scalar principle, which encompasses that authority flows downward, i.e. the person at the top, delegates authority to the person at the middle, who in turn delegates the authority to the bottom level. When it comes to the quantum of authority, it is highest at the foremost level, which tends to decrease at each following level. 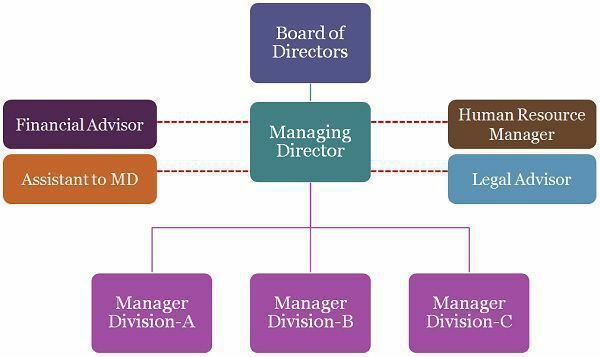 This type of organization is characterised by a direct chain of command, which is like a thread that passes through all the members of the organization. So, who is responsible for what and who is accountable to whom is defined, that is to say, subordinates work under the supervision of the superior. Line and staff organization is the organization that combines the merits of line and functional organization, by adding the functional specialist to the line organization. Here, line authority stays same, as in the case of line organization and it flows downward. The functional experts, give advise to the front line managers, in the matters relevant to the object of the organization. The specialist works as staff and serves the line officials, by supporting and guiding them, whenever necessary. There are a number of benefits of line and staff organization, in the sense that it gives relief to the line managers and they can concentrate on the implementation of policies and plans. Moreover, there is a benefit of specialization, as in work is divided between the line and staff executives, and they focus on their respective area. In this type of organization, the decision making is quick and easy, as the expert advice can help in making better decisions. Line organization can be understood as a vertical organization, wherein the superior can give orders to a subordinate, through a direct chain of command. Line and staff organization is the organization structure, in which there is a normal departmentation of the regular business operations, and there is the functional specialist to perform specialised activities. While line authority relies on command, line and staff authority is based on command and advise. As we talk about discipline, line organization, is strict, whereas line and staff organization is loose. In a line organization, the line executives are the generalist, who is directly responsible for accomplishing the objectives of the organization. On the other hand, in line and staff organization, the staff executives are specialist who supports and advice the line managers in the accomplishment of organization’s objectives. There is centralization of authority in a line organization, and so all the decisions of the organization are taken by the top authority only. Conversely, in line and staff organization, there is a combination of centralisation and decentralisation, in essence, some of the decisions are centrally taken while some are diffused. Line organization, is good for small corporations, as, in such a structure, the authority is concentrated at the top, which makes it difficult to manage if the number of employees are large. On the contrary, Line and staff organization, is best suited for large corporations due to the presence of staff specialist, who use their knowledge to advice line managers on complex issues. To sum up, line and staff organization is an advancement over the line organization, So, it is quite obvious that the former is better than the latter as it reduces the limitations of the line organization. At present, line and staff organization, is implemented in most of the organizations, because in the competitive business environment, specialised knowledge is required to survive and grow in the market.